1. 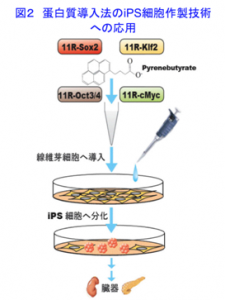 Kaitsuka, T., and Tomizawa, K. Cell-penetrating peptide as a means of directing the differentiation of induced-pluripotent stem cells. Int. J. Mol. Sci. 16, 26667-26676, 2015. 2. Gotanda, Y., et al. Efficient transduction of eleven poly-arginine peptide in an ischemic lesion of mouse brain. J. Stroke Cerebrovasc. Dis. 23, 2023-2030, 2014. 3. Hakim, F., et al. High oxygen condition facilitates the differentiation of mouse and human pluripotent stem cells into pancreatic progenitors and insulin-producing cells. J. Biol. Chem. 289, 9623-9638, 2014. 4. Michiue, H., et al. The acceleration of boron neutron capture therapy using multi-linked mercaptoundecahydrododecaborate (BSH) fused cell-penetrating peptide. Biomaterials 35, 3396-3405, 2014. 5. Kaitsuka, T., et al. Generation of functional insulin-producing cells from mouse ES cells through 804G cells-derived extracellular matrix and protein transduction of transcription factors. 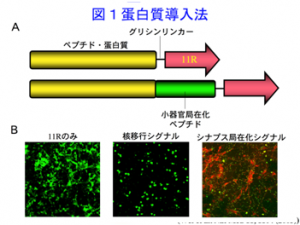 Stem Cells Transl. Med. 3, 114-127, 2014. 1. Ueda, Y., et al. Induction of autophagic cell death of glioma-initiating cells by cell-penetrating D-isomer peptides consisting of Pas and the p53 C-terminus. Biomaterials 33, 9061-9069, 2012.